This is a classic Australian build that takes you back to a by gone era when true craftsmen toiled by hand to build something beautiful ! Have you been looking for a classic timber boat? This is it. The work has all been done. Reportedly designed by the famous designer C Raymond Hunt the father of the deep - V hull design who began their operations in 1961. The design was utilised by Culity Timbers in building the boat in 1962 for the Culity Timber family South of Perth and reportedly was a common sight at Rottnest and the waterways of the Swan River. She is one of only two that were apparently built in WA to this design. Found a little wanting from neglect 15 years ago the current owner took her from the water in Bunbury and spent the years between 2012 and 2015 bringing her back to the type of condition she was accustomed to ! This is a modern boat in almost every way now with just the hull and engine from those early days. Modern electronics, modern lighting and fixture throughout. Complete with a self sufficient solar system shore power is a distant memory. She presents in an amazing manner ! 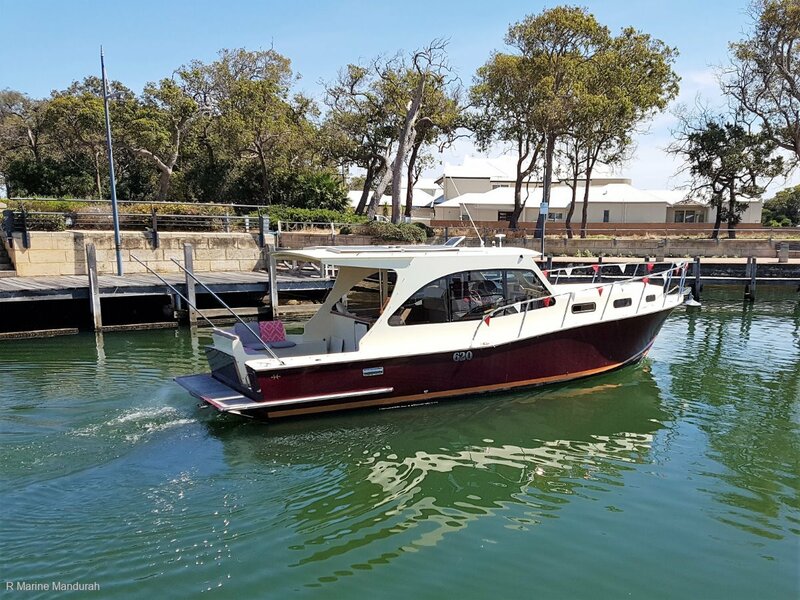 This is a boat with style and grace and would be well suited to a family looking for an amazing river boat for Sydney harbour or cruising the Swan. There is room for two to sleep in the forward cabin, it does have a toilet system and comes complete with a suitable galley so romantic weekends away with a loved one are all on the cards. Relax in the cockpit or curl up with a book in the saloon. Originally fitted with twin engines she currently sports an overhauled single Volvo Penta THAMD70B via a V-Drive gear box to a shaft. This engine was installed following the overhaul in 2016. Pushing along at a Romantic 12 knots for less than a jerry can of fuel an hour I am told, she will stretch her legs if required and fly along at 14 knots should the need arise.. But why would you ! We are able to arrange shipping for this boat to any area in Australia and internationally if required. Call the office on 08 9583 5355, Paul on 0427 949 293 or Cruze on 0456 949 293, we are here to help and will be happy to arrange a viewing of this unique Australian timber boat. For the classic timber boaties out there or the true romantic this is the boat you have been looking for !